Flight action shooting game launches October 20 in Japan. 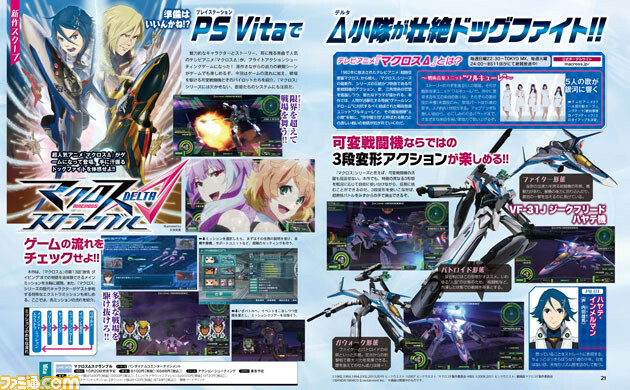 The latest issue of Weekly Famitsu reveals Macross Delta Scramble for PS Vita from publisher Bandai Namco. The flight action shooting game lets players use Variable Fighters with three stages of transformation while taking part in grand Delta Platoon dogfights. It will launch on October 20 in Japan. Update 8:20 a.m.: New details have come in. The standard edition of Macross Delta Scramble will cost 6,100 yen, and a “Run Pika Sound Edition” will cost 9,000 yen. The Main Missions cover the story up until episode 13 of Macross Delta. Guests from across the Macross series will appear for Extra Missions. The game is in development at Artdink.